Monday is here again, and fortunately I got a good enough sleep despite of my camping trip. It was very short, yet so much fun! I had a short hike and enjoyed the outdoor. It was really refreshing to take a break from all the business between work and studying. 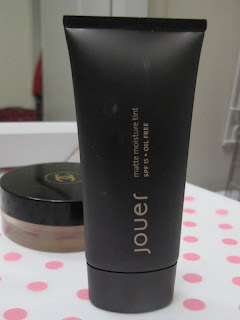 I first heard about Jouer foundation from Ingrid (missglamorazzi). The packaging looks a lot like Laura Mercier silk creme foundation, which I truly like. The product isn't technically called a foundation, it's called a moisture tint. I didn't pay attention when I ordered it online. I ordered it from nordstrom and picked my shade also online. It was a bet, actually. I've never swatched it before, so I relied solely on the pictures. Nordstrom's free return shipping gave me the confidence to do this, although I wouldn't recommend you to do this ever so often. I just didn't have time to go to the mall, and I really wanted to try this out and see what the fuss was all about. I tried it on Friday night, and I instantly fell in love! 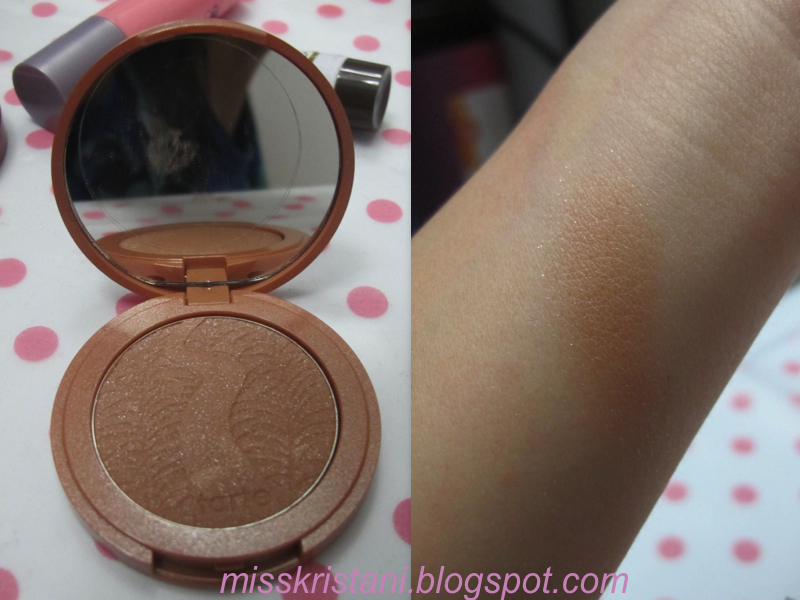 When I realized it was a "moisture tint", I thought I wouldn't like it, but man was I wrong. I couldn't wait to share all about it with you guys, but I was so limited on time and didn't have a chance to do it. I specifically used this product so I can share pictures and rave about it! The consistency is very light. It's not as thick as foundations I typically use. I can barely feel I use anything on my face. It's so lightweight, and it feels more like a moisturizer. It doesn't clump like thick foundation would typically do if you don't have dry patches. It glides smoothly and blends effortlessly. It doesn't feel heavy at all. 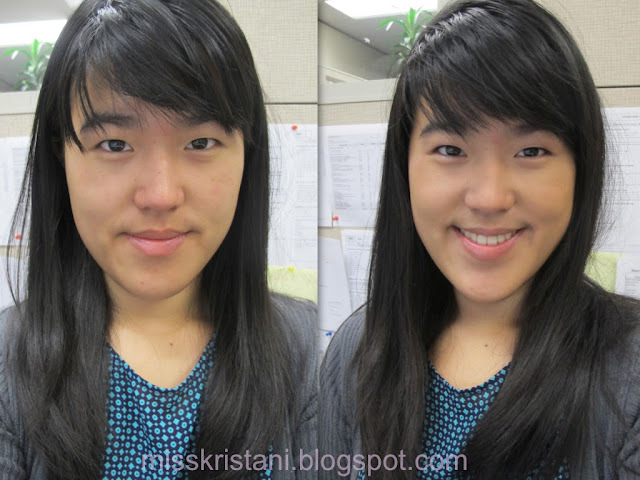 If you have major discoloration, you cannot rely on this alone. You'll still need a concealer to cover it up. I guess this product wasn't designed as full-coverage foundation. It acts more to even out your skin tone. I have a little bit of acne scaring on my left cheek as you can see in the picture. This disguises it a little bit, but doesn't cover it completely. Man oh man, this is the best part of the product. I honestly couldn't stop looking myself at the mirror. This claims to be a matte product, but I don't find it drying at all. It does have a matte finish, but it's more like a powdery/dove finish if you know what I mean. 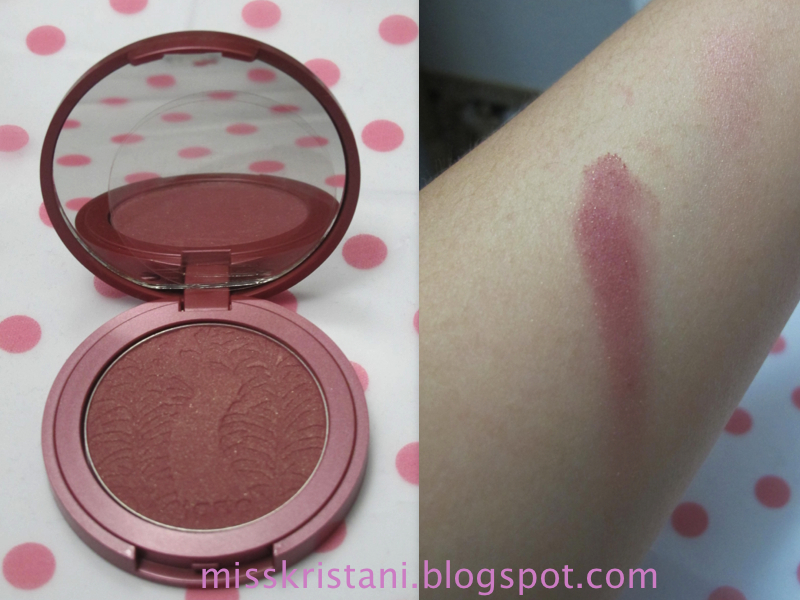 I don't feel the need to powder after applying this, but I still do it anyway just because. I totally recommend this product for everyone, especially for those who are new to makeup. Don't get me wrong, it works wonder for me, but I can see this to be a good transitional product for newbies compared to directly go for a heavy coverage foundation. Hello everyone! I hope y'all had a great weekend. I had a sleepover with my girlfriends, and it was a lot of fun. It's been a while since I had a girls' night. I sure hope I get to do it again anytime soon! Do you remember the shower I mentioned about in my last post? Yep. It was amazing. I felt like I was under a waterfall. A-Muh-zing! I also got a little bit sunburn on my chest. I played volleyball in the park on my friend's birthday picnic yesterday. I wasn't really a volleyball girl when I was in high school, but somehow it was really fun. With the cost of sore arms and red chest, but it was worth it. Another simple look of mine. I always prime my face with moisturizer and a sunscreen for my day makeup. Sometimes I also add another primer if I feel like my skin is dry and patchy. I use two mascaras because I feel like the Cover Girl last blast volume does separate my lashes and gives them a nice length, but it doesn't build volume like my trusty Almay get up & grow mascara. I love this mascara. My friends thought I wore falsies when I use this, but it smudges a little bit throughout a day. That's why I prefer the last blast volume for a warmer day. It doesn't smudge at all on me. Not even a little bit. Well done Cover Girl! I recently discovered Estee from essiebutton on youtube. I freakin' adore her! She is hilarious and I love watching her videos. In fact, I am watching her on playlist as we speak. She and her boyfriend successfully made me crave for a grilled cheese sandwich through their vlog, Grilled Cheese 101. I went to Target with the grilled cheese in my mind. I bought the fake plastic-y cheese, which according to them is the best cheese for a grilled cheese sandwich. I added salami and used whole wheat bread instead the kind of bread they used in the video. It was a pretty satisfying lunch for me. My boyfriend is coming home tomorrow. It's been fun to have girls' weekend and me-time, but it's time for us time. I miss him!! I hope y'all have a great week ahead! Happy Friday peeps. So far this week has been like a roller coaster ride. A dear friend of mine lost her dad with no warning whatsoever, and I am truly sad for her. The only thing I could do for her is just praying for her and her family. I can't imagine how it'd feel for me to lose a family member. My boyfriend is on a "guys bonding" trip to Zion National Park in Utah. They'll go camping for one night to Narrows and enjoy the road trip from Thursday to Monday. I'm so jealous! But us girls, bu us I mean me and my girlfriends, are going to have a sleepover tonight at my friends' new apartment. They just installed this fabulous shower that I'm dying to try out! It's be loooonnngggg time since I last had a girls' night. I think it's important to just hang out with your girl friends and just chat about anything. I don't really have that a lot ever since I've moved to the states. I love this peplum top. I find it's quite tricky to find a figure-flattering peplum for by body type, but when the peplum cuts lower on your torso and the material is not as tight, it's can look gorgeous. I thought this would be good for a professional setting. They didn't have my size, and this was just too long and loose for me. On to my favorite store. I came to return some stuff and planned to do an exchange, but nothing really worked on me. The sale section, which is the only section I truly care about (guilty as charged), didn't have any good finds that caught my eye. Then there was Forever 21. I gotta admit, I don't really like going to the store. I like shopping on their online shop but not so much at their physical store. Everything is just scattered around, and the store always looks like a mess. But I went in there anyway just because. After all that, guess what? I didn't get anything. Haha. I wandered around the mall for 2 hours just do have some me-time. Then I went home, caught up with the latest episode of Pretty Little Liars and had dinner. I watch this show just for the sake of watching it. It doesn't thrill me anymore. All the lying game is just getting old for me. The story doesn't make any sense, and the characters are just plain not intriguing anymore. Am I the only one who's feeling like this? Anyway, thanks for reading. Have a great weekend! Happy Friday everyone! I am glad weekend is just peeking around the corner. The week is just gone by really fast, it's not even funny. I went to the DMV yesterday to renew my driver's license. People told me to go online or just do it by mail, but I really wanted to get a new picture. My current one was taken about 5 years ago, and it just wasn't pretty. Luckily, DMV is just less than a minute away from my home. So I just got a number and went home for about an hour and went back, so the wait wasn't that bad for me. My lips have the tendency to dry for as long as I can remember. I have tried different kinds of lip balm, but the my lips seem to not be able to lock the moisture for a long time. 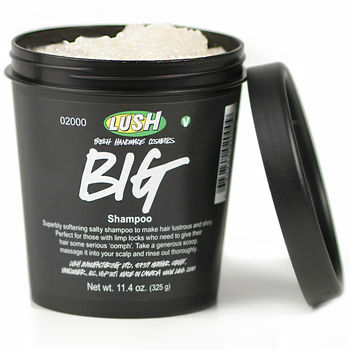 When Tanya from pixi2woo raved about this product on her videos, I was intrigued. I checked on Amazon, and it was available on prime shipping, so I got my self one. I've checked other reviews online before I bought it, and it is a best-seller. It's not specifically made for lips, it's more a general skin remedy for sun-burned skin, rough elbows, calluses and also chapped lips. It can also be used as brow gel and cuticle care. You can read more details here. 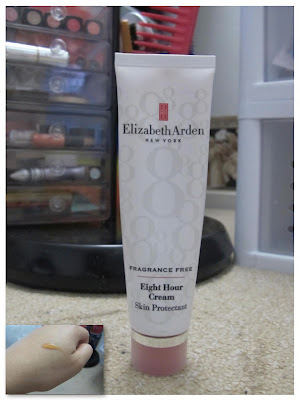 It's mentioned on the website that a makeup artist uses this cream as a gloss. I can see that, but I don't think I would do that. When I finally got my hands on this, I didn't know what to expect really. I thought the product would be like a white liquid gel, but it wasn't. The texture is rather wet and slippery, kinda like honey but not as sticky. And the scent, ugh. It's supposed to be "fragrance free", but let me just say, it's not the best scent in the world. I don't like it, but I can bare with it if the stuff works. For me personally, it's not a bad product. 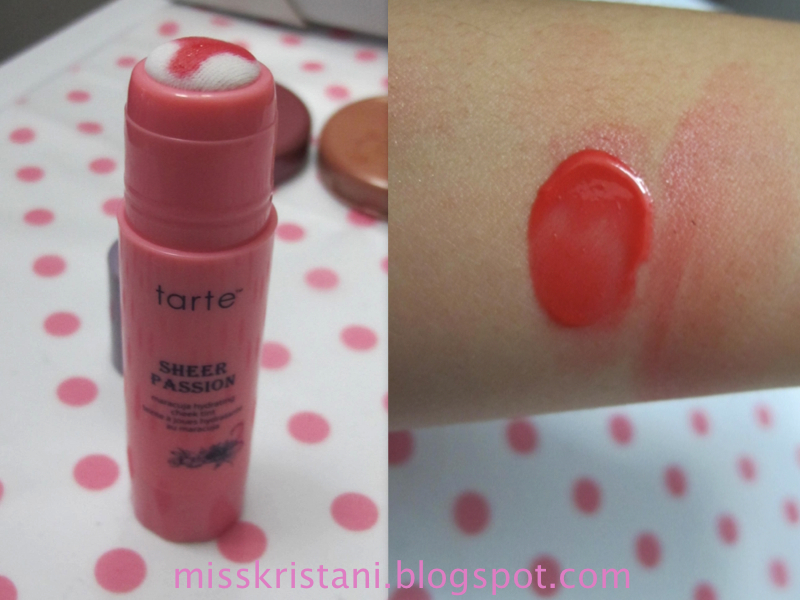 It can work as a lip balm, but I don't find it long lasting at all. I've been using it at night before I go to bed, and the next morning my lips are just as dry as before I put it on. I haven't used it for other things, really. I just am disappointed with this purchase. It may work for all of those mentioned above, but I have other products to take care of those. While having a all-purpose product might seem efficient and handy, I prefer to have several for different uses. 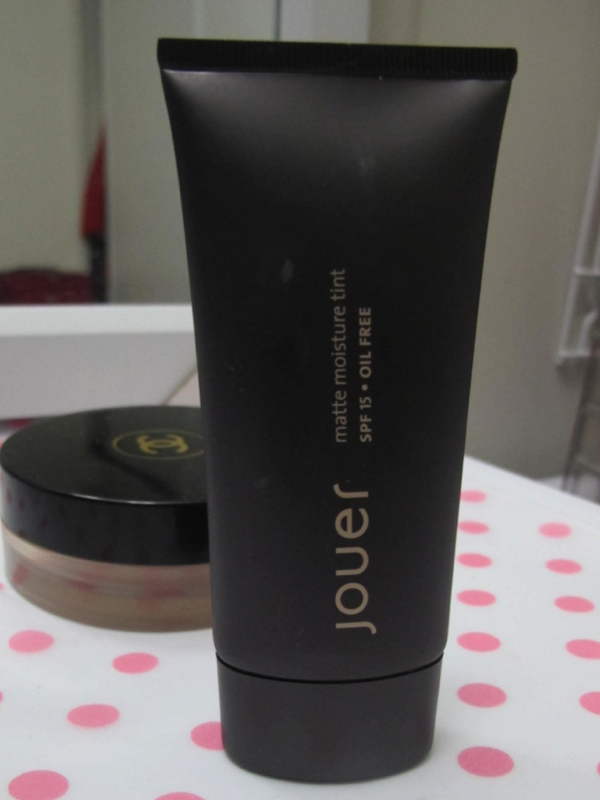 I will continue to use this, but I don't see myself repurchasing this one anytime soon. Maybe when I find a way to use this..
Hello everyone! Sorry for my lack of posting. I had my first CPA exam last Monday, and now I am studying for my second one. I've been eyeing an eyeshadow duo from Estee Lauder in "Raisins". I saw it demonstrated on youtube, but I can't remember whose video it was. Anyway, I like the pretty duo, it has this pink and burgundy. I just think it's a great alternative for the basic brown colors which I always tend to reach for. Long story short, when I see the price tag, $32 for a duo, I just couldn't justify myself, so I didn't go for it. I saw this Maybelline duo at Target, and I see the color combo kinda reminds me of the "Raisins", so I got that for about $4. I tend to overlook Maybelline products because they're not my favorite. If it weren't for the good reviews, or the color combo in this case, I wouldn't usually buy Maybelline products. The formulation is pretty good. They're not powdery or anything, but nothing really spectacular. As for the lasting power, I did use a TooFaced primer when I tried this out, but throughout the day, the color didn't look as pretty as when I first applied it in the morning. 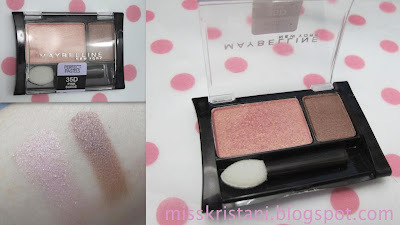 They oxidize as the day goes by, which most beauty products do, but I notice with this shadow, they do a little bit more. All in all, I do like the color. I like that it's not powdery and it's quite easy to blend. If you're looking for an alternative from your everyday brown, this could be it. But, will I buy another shade from the line? Probably not. For $4, I still can get the same if not better quality shadows from Wet 'N Wild. P.S. : I have totally been enjoying watching Tati from GlamLifeGuru on youtube. Go check her out! She's awesome!